The only model available will be the opaque Fyrtur, an Ikea spokeswoman informed Fast Company. The translucent Kadrilj model won't be coming to the U.S., even though both lines are already out in Europe. European prices range from 99 to 155 euros, or about $113 to $181. Available dimensions run from 60-by-195 centimeters (23.6-by-76.8 inches) to 140-by-195 centimeters (55.1-by-76.8 inches). Very few HomeKit-compatible shades are on the market, typically because of factors like custom sizing and elaborate electronics, which can also push prices out of the average person's range. Ikea's product gets around these issues with a limited selection of sizes, and a rechargeable battery that has to be periodically removed. People will be able to buy extra battery packs to minimize downtime. 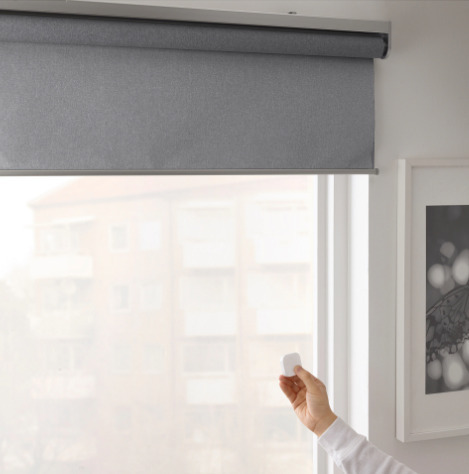 The blinds also require buying Ikea's Tradfri hub for smarthome functions. Aside from HomeKit, the hub works with Amazon Alexa, Google Assistant, and an Ikea app. The Swedish retailer offers a collection of Tradfri-enabled accessories, including plugs, lights, and motion sensors.